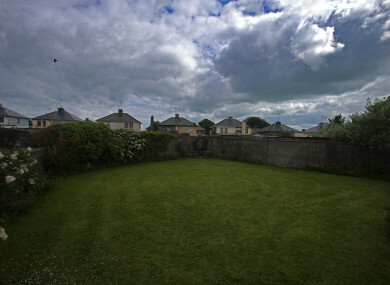 The site of a mass grave for children who died in the Tuam mother and baby home. MINISTER FOR CHILDREN Katherine Zappone has published the report by the Expert Technical Group on the site of the former Tuam mother and baby home in Co Galway. Even then, identification will be extremely difficult, and will depend on the quality of the remains recovered. The report identifies five possible options for how the site should be handled. Speaking on RTÉ’s News at One this afternoon, Minister Zappone outlined those options and the difficulties that go with them. The other, “more intrusive” options have to do with exhuming the human remains that are there and interning them elsewhere. This includes “further examination of the area… and again possibly to exhume the remains if ultimately that is the request of people and the decision of government”. But the report did identify some of the difficulties that go along with excavating this particular site. “It’s more technically difficult to identify the remains of children under two,” Zappone said, adding that this site is particularly complicated because some of the remains had been “mixed together”. She said that something the families would need to understand would be that “in trying to identify the remains, sometimes you can destroy them”. “I know from experience that an informed debate does not necessarily make difficult decisions any easier,” the Minister added. I want to ensure that whatever action is taken respects the memory and dignity of those who are buried there and takes account of the concerns and wishes of all who are affected, whether as former residents of the home, relatives of those who may be buried there, or as local residents who live near the site. Speaking to reporters at Leinster House this afternoon Zappone said that “money is not the issue” and that a consultation would take place with the relatives of those buried at the site, looking at all possible options. The costs of the five options range between €500,000 and €5 million. What will happen next to the site will depend on the results of the consultation process, which will be report back to an inter-departmental group within three months and the Group will then propose a course of action for consideration by the government. Galway County Council has also set up a website and a phone number for people to get in touch, the Minister said. Last week, the Commission into Mother and Baby Homes said it will need an extra year to complete its full report into 14 former homes, including Tuam. The government has agreed to extend the deadline of the report from February 2018 to February 2019. The commission has already met 346 former residents of institutions under investigation, with meetings taking place across the country and in the UK. A further 200 people have applied to meet the committee. In March of this year the Commission confirmed that a “significant” number of human remains were discovered at the site of the former Bon Secours home in Tuam. Scientific analysis put the age of death between 35 foetal weeks and two to three years. The work of Catherine Corless, an amateur historian, led to the discovery. In October, Corless was awarded the Bar of Ireland’s Human Rights Award for her work regarding the Tuam site. Earlier, Zappone apologised to survivors of the former mother and baby home in Tuam after what she described as “highly confidential information” about the site was leaked to the media. In a statement issued this morning, Zappone said she was “disappointed beyond words” that the information has “found its way into the media”. “This goes against my promise to the survivors and families that I would inform them of developments in advance of information entering the public domain. Zappone’s comments related to an Irish Times article published early today which reported that children buried at the site may never be identified. The article reported that the expert group had said DNA testing on the remains found at the site was “highly unlikely” to succeed. This afternoon’s report by the expert group bore out the content of the Irish Times article about DNA testing. Email “Report sets out five options of what could happen at Tuam”. Feedback on “Report sets out five options of what could happen at Tuam”.